Davout’s three infantry division on December 23rd, under Napoleon’s detailed orders, were in position to attack the Russian army under the command of Ostermann on the east bank of the Wkra. The battle opened with Morand’s troops making a frontal attack against the village of Czarnowo. It was taken, but the Russians rallied and after heavy fighting the village was recaptured. On the French left, Petit lead the assault and crossed the Wkra and succeeded in capturing the Russian redoubts. 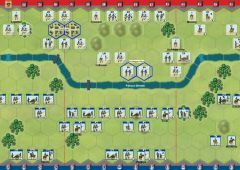 A Russian cavalry and infantry counter attack both failed to retake the field works. After these failed attacks, Ostermann ordered his army to withdraw to the east. • The Narew River is impassable. • The Wkra stream is fordable. I lost the battle as Russians with 7:6. 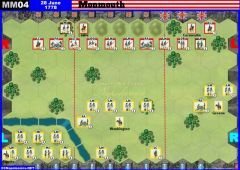 My French opponent opened the battle with the attack on my right by was defeated with heavy casualties including a general. French attempt on the opposite flank also failed, but in the centre Russian light infantry was mostly removed from the ridge. 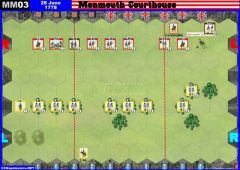 At some point of the battle Russians held a 6:1 lead in flags but could not finish the opposition. 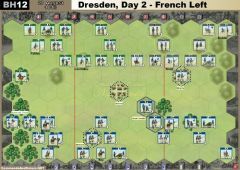 French renewed drive in the centre steadily destroyed Russian light infantry. Russian attempt to destroy French infantry in the woods with cavalry was not entirely successful. 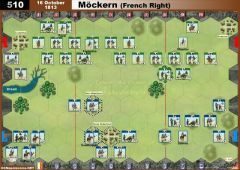 French fled and in the next move destroyed the defenders of the works in the centre gaining last two flags because they managed to kill the general as well. Played this again in reverse against The MP last Saturday. It was two months after the first encounter, so we both had to remember what we were about. I played the Russians and was delighted to see the French attacking the town of Czarnowo itself. 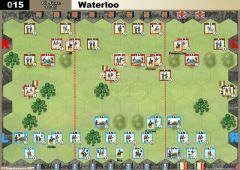 However, his use of the LC nearby forced a couple of infantry units into square and all of a sudden I was down to two cards and unable to react where and when I wanted to. A few lucky battle back die results kept me in the game and, after he ran out of cards on the right flank, I managed to get my own LC across there and clear up the mess, eventually bringing my two infantry units back out of square and then destroying all his units and leader on that flank. But all the while the pressure was building in the centre. Not wanting to simply give up a banner for the redoubt there, I probably hung around too long and eventually lost it anyway. 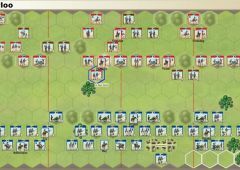 The French were advancing in force and, as I was finally winning on the Czarnowo flank, launched a bayonet charge against the artillery on my right flank and supporting infantry, to wrestle his final banners needed to win. 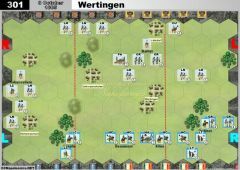 I had just re-occupied Czarnowo and so would have gained the seventh banner myself to win had his bayonet charge failed. So, all in all, a very close encounter well fought and very exciting. I agree, patience is key for the French. I actually think this is true for most scenarios where they're the attacker. My opponent's action to force me into square, halving my card count, was a superb tactic. After that, I expected him to do his utmost to keep me like that and only attack elsewhere when his cards permitted. With only two cards, the Russian has to be VERY lucky to be able to react to wherever the French are forcing the issue, but it does need patience by the French not to lose banners elsewhere needlessly. 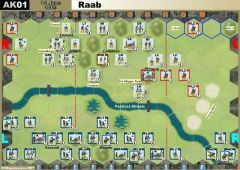 After playing this from both sides, the poor Russian card count really does give the feel of the situation the Russians really were in during the night attack, and I'd not want to start on a four card count again if possible. I just won this as the russians ~ but my opponent did not play very well I must admit. The key to winning was withdrawing the russian lights from the center hills when they had taken damage, not ignoring the flags caused by the french fire. 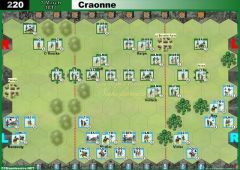 This left the 1 block light units into the safety of the hills, and allowed the CU and Light cavalry to charge the french center, neutralising the center for the most part? The russian right flank is super strong with that artillery supported by enough infantry. The best way for the french to win is to shoot out the center with the arty, and be very patient. My opponent tried to win too fast, and lost because of that. Played this scenario, any Russian scenario, for the first time on Thursday. French won 7-4 fairly easily, despite some decent, aggressive play by the Russian. The 4-CC count for the Russians is a real killer. Looks unbalanced to me, although we will play the reverse match in a couple of weeks or so and hopefully I'll have worked out a way to win with the Russians. I've attached the final positions. All the action was in the centre ... I never even tried to capture Czarnowo itself as there seemed no need. After the action, I re-read FL Petre's account of Davout's crossing of the Bug and the action at Czarnowo. Hadn't realised it was actually fought at night, and Davout's divisions followed Napoleon's orders to the letter with great effect. Played this Friday evening as the Russian against quite a canny gamer. Really struggled to get a good battle going for my green blocks. In the end I found being aggressive with the Czar's troops brought the most benefit. Lost 7-4 in the end and will obviously play the same opponent again with sides reversed. Hopefully I'll get a win back at him, but I did struggle using Russia for the first time. Need to perfect my skills with the green blocks. 15 games were played with this scenario at HMGS Hurricon 2013. Played twice during our Friday session. French one once, Russians won once. Played twice, both French wins, 7-5 then 7-4, Czarnowo never taken, main action on the center hills. We've been playing it last saturday and Russians won 2 times (7-4 & 7-6) but very close the 2 times. In MT6, 4 out of 5 games were French wins, often by a wide margin. Yet the scenario is rated 70%+ Russian here. Seems quite unusual.